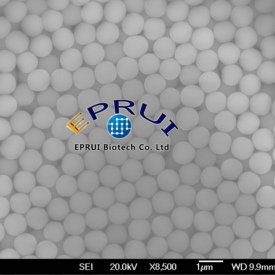 EPRUI Biotech Co. Ltd. owns 2000㎡ research lab which equips the most advanced analytical instrument and inspection equipment including several high performance liquid chromatography /HPLC made by Waters and Shimadzu, AKTA purifier by GE, FTIR ultraviolet spectrometer, ultraviolet spectrophotometer, high speed centrifuge and so on. 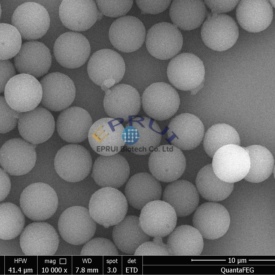 EPRUI Biotech Co. Ltd is the top monodisperse microspheres supplier in the world who is able to supply 20nm-1000um various kinds of microbeads with precise particle size control technology. 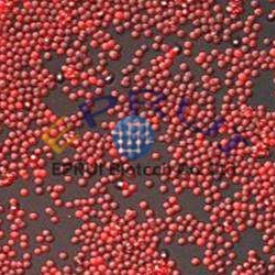 With precise particle size control technology, EPRUI supplies monodisperse microspheres with narrow particle size distribution. The average CV. is below 3%. Besides, we are able to offer unbeatable price due to large scale production ability. The annual output of monodisperse microspheres reaches hundreds of kilos. 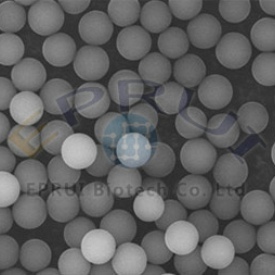 Polystyrene divinylbenzene or PS-DVB microspheres are robust polymer material used as the base framework for most polymer HPLC packing materials. The high degree of cross-linking with divinylbenzene makes the polymer bead extremely durable for high pressure applications including as reverse phase chromatography(RPC) packing resin, ion exchange chromatography column packing resil, Solid phase extraction(SPE) chromatography packings, sulfonated PS/DVB resins for separation and analysis of sugar. Besides, we can also supply size controllable magnetic beads which are easy to disperse and has good super paramagnetic effect and biocompatibility. By linking different functional groups such as –NH2,–COOH,-OH epoxy groups, etc, magnetic beads can be widely used in the industries of clinical diagnosis, biological imaging, target drug delivery, cell screening, immunoassay, and especially protein, antibody, DNA/RNA/ nucleic acid purification. Based on the same or even better quality, we offer much more competitive price than domestic and overseas rivals. 30 days unconditional return policy is accepted. If order above USD$1000, we offer free delivery service.